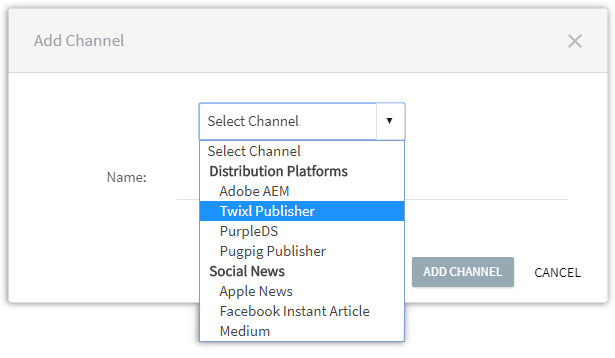 Canvasflow supports publishing content to multiple different locations. These locations are known as 'Publish Channels' and are managed on a per publication basis. Navigate to the publication you wish to add a channel to and click 'Settings'. From the Channel type menu, select the channel type you wish to add. Add your channel credentials and click 'Add Channel'. Locate the channel you wish to edit, click the more options and select 'Edit'. Make the required changes to the channel information and click 'Edit Channel'. The changes will be immediately applied to your publishing channel. Locate the channel you wish to edit, click the more options and select 'Delete'. Click 'Yes, Delete it' to delete the channel. (You cannot delete a channel that is currently connected to a publication - see below). The channel will be removed from your publication. You will no longer have the option to publish to this channel. A channel that is currently in-use, cannot be deleted without first disconnecting it from the the publication. This can be done by setting the channel view to Default from the article manager. Once the Default channel view has been selected, the channel can be deleted.